Stencils by Moose in San Francisco's Broadway tunnel. I have always been a fan of street art. The creativity artists display, adapting to different urban environments, never ceases to amaze me. However, in recent years, I have become much more conscious of the environmental impact people have on the earth, and my love for street art developed into this kind of love-hate relationship—love the art or hate the toxic chemicals? 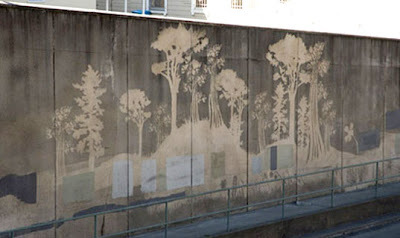 Lucky for me, the street artist Moose pioneered the Reverse Graffiti Project, a new street art concept based on cleaning. Details of the wall at the Broadway tunnel. The idea is this—instead of using paint to deface existing structures, street artists wash away years of dirt and grime on a surface to create their installations. High pressure water hoses, sponges, stencils and biodegradable soap are used. The intent is primarily environmental: using drawings, artists show glimpses of what preexisting structures look like under their black sooty veils, and what the public could be experiencing instead. These clean spots starkly contrast the darker dirty walls and remind us how much the pollution from cars, factories, and people affect our neighborhoods. Doug Pray documents the process by which Moose creates art in the San Francisco Broadway tunnel. 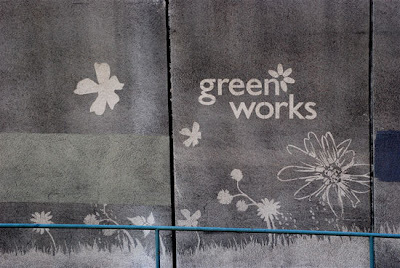 The project was powered by Green Works cleaners. 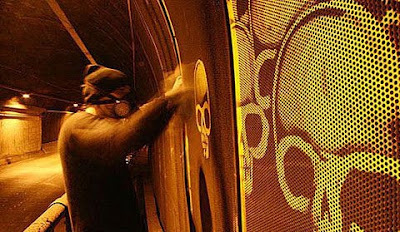 Alexandre Orion used only water and a cloth to etch skulls in a grime-encrusted tunnel to remind commuters how harmful the exhaust from their vehicles are. Artist Alexandre Orion works on an underpass in São Paolo, Brazil. When the police showed up, they could not charge Orion with any crime since he was not defacing any structure. As Inhabitat aptly puts it: When is cleaning the sidewalks a crime? When you’re doing it to create art. Obviously. So naturally, the fire crew hosed down the entire section of the tunnel where Orion drew. When he later simply picked up on the other side of the tunnel, the officials were so enraged they decided to not only clean the whole tunnel, but every other tunnel in São Paolo. 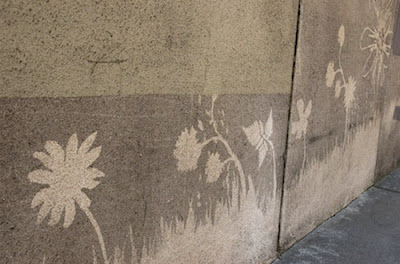 Reverse graffiti encompasses all types of graffiti that does not use harmful chemicals the way traditional graffiti does, and often embodies an eco-friendly message. Other examples include Edina Tokodi's green graffiti made by moss and Scott Wade's dirty car art. More pictures and stills here. can you still see the mural on the Broadway Tunnel?